For this project, Romano Homes created a stylish, contemporary home that embraces warm tones and playful shapes. The home sits on a wide frontage that overlooks parkland, so it was important to take full advantage of the peaceful views. Showcasing impressive vistas, each bedroom is a tranquil retreat that’s ideal for relaxing. A curved void is located between the children’s wing and the main bedroom, which are separated with differing architectural treatments. A portion of the upper level cantilevers over the garage and is clad in western red cedar, which provides visual softness and contrast. 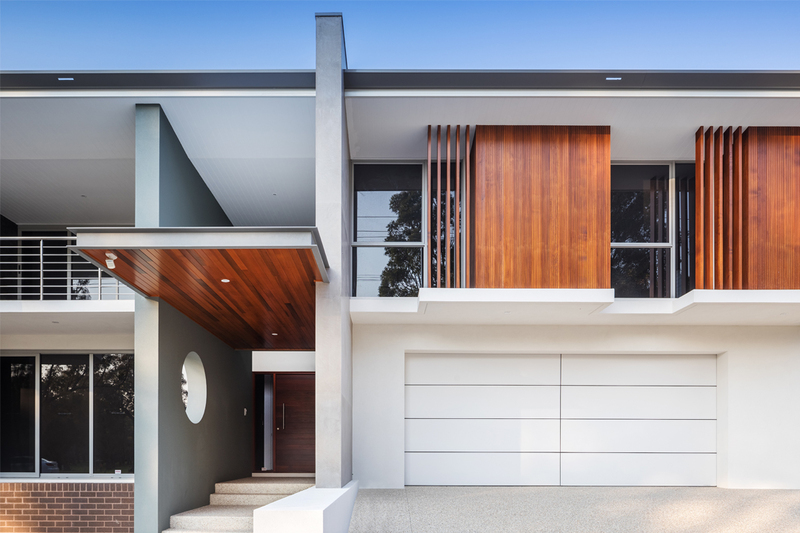 The exterior entry has a double-height void and a large concrete spine wall, which is a standout feature. A cantilevered canopy was included to avoid a ‘white box’ appearance. Featuring a warm timber finish, the canopy adds a simple elegance to the home. The home’s design combines a range of interesting materials and architectural detailing to achieve a contemporary feel. The façade incorporates brickwork on the lower-left side, which has a neutral hue that sets the tone for cool colours throughout the interior spaces. Polished plaster can be seen on the exterior, which adds additional texture. Rendered surfaces were also incorporated to increase visual stimulation and achieve a modern aesthetic. Passive solar design principles were an integral part of the design brief. 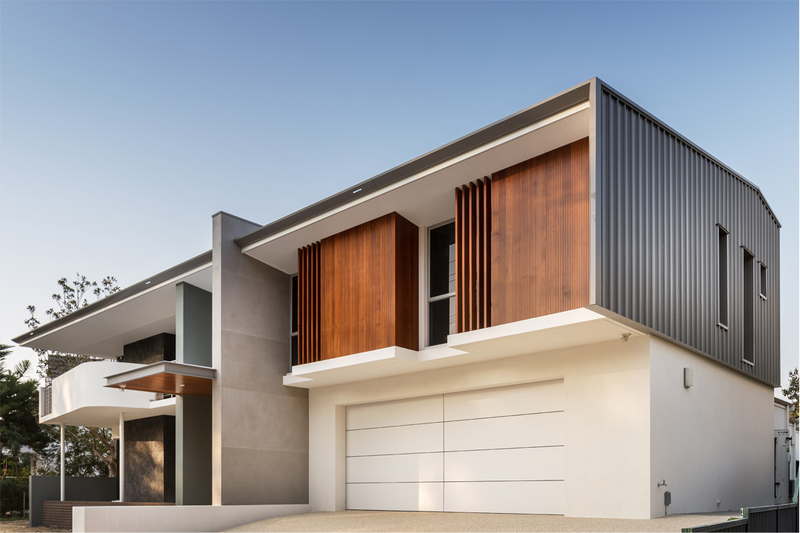 The L-shaped home incorporates energy saving features, including large north-facing windows and sliding doors, which reduce the need for air conditioning in summer and heating in winter. The creation of a wide hole in the entryway allows natural light to flood the space, while fostering a shapely and soft aesthetic. To the left of the light-grey wall, charcoal-hued polished plaster runs up the length of the home. This bold colour choice blends seamlessly with the guttering on the roof, while the use of varying grey tones creates a calming and serene ambience. 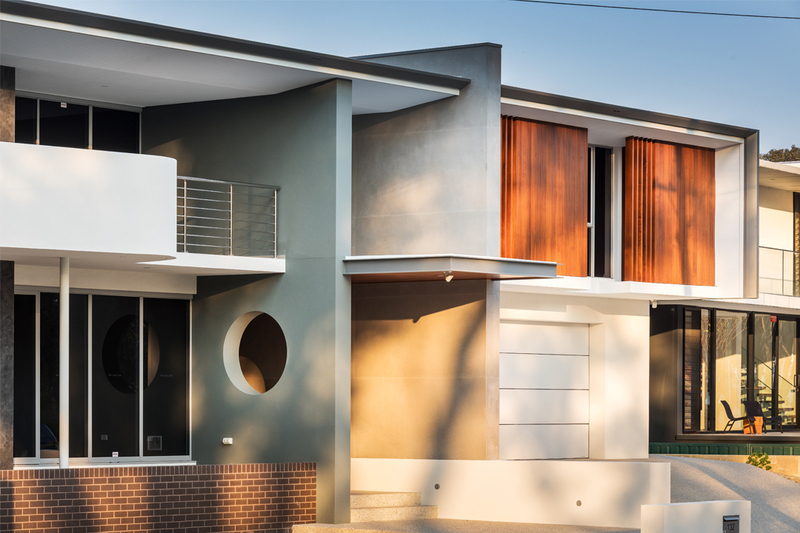 The finished product boasts street presence, individual style and liveability. It is a testament to Romano Homes’ excellent planning and constructions skills, as well as its unrivalled attention to detail. 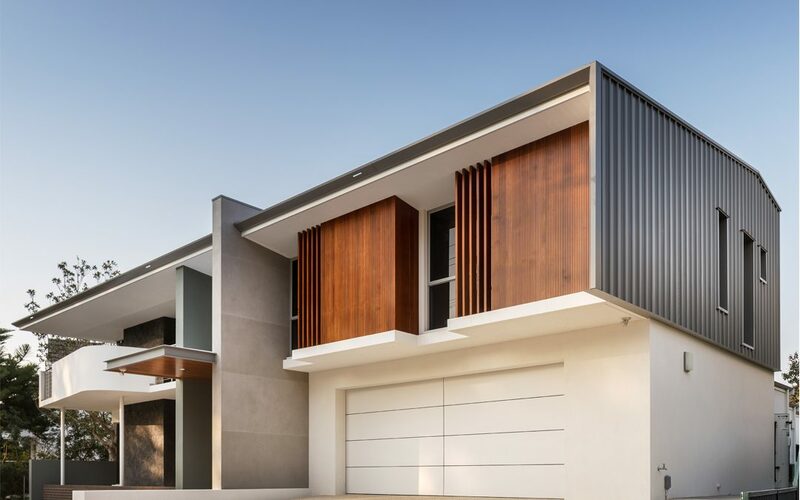 Specialising in individually designed, client-driven homes, Romano Homes maintains a focus on passive solar design and cost-effective building solutions. The company is renowned for its individual designs and only builds a select number of homes per year, which allows it to liaise closely with clients. Romano Homes builds meaningful relationships that are based on trust, and delivers high-quality homes on time and within budget. The company is a collaboration of experienced and passionate industry professionals who focus on the pillars of outstanding design, building and project management. Individuality, quality and collaboration are central to the Romano Homes philosophy, and the award-winning team will be excited to take on your next project.